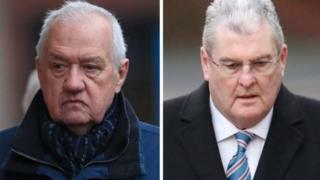 The six men and six women on the jury have been sent out after a trial at Preston Crown Court lasting 10 weeks. Former Ch Supt Duckenfield, 74, denies the gross negligence manslaughter of 95 Liverpool fans at the FA Cup semi-final in Sheffield on 15 April 1989. Ex-Sheffield Wednesday club secretary Graham Mackrell denies a charge under the Health and Safety at Work Act. The jury has heard that 96 men, women and children died as a result of a fatal crush on the Leppings Lane terrace. Jurors heard that former South Yorkshire Police officer Mr Duckenfield, now of Ferndown in Dorset, gave the order to open exit gates to the ground after crowds built up outside. More than 2,000 fans entered the ground after the gate was opened, with many making their way down a tunnel to the central pens of the terrace, where the fatal crush happened. The prosecution allege Mr Mackrell, 69, in his role as Sheffield Wednesday's safety officer failed to ensure there were enough turnstiles to admit fans at a rate where there were no unduly large crowds outside. In his summing up on Friday, Judge Sir Peter Openshaw told members of the jury to be "dispassionate" and "objective" as they strive to deliver verdicts. Addressing the twelve men and women, he urged them to put aside their "emotions and sympathies" when reviewing the evidence.